How does the Canister Filter operate? Do you keep an aquatic pet? Or would you add a fish pond to your garden? Either way you should begin with a thorough search for the aquarium or best canister filter. Often people end up killing the poor aquatic creatures by letting the toxins from excretion and debris from food, dirt toys, silt, etc…affect the water quality. A good water filter is like a breath of fresh air for these creatures…make the right move early and invest in a good one. Natural Look and Feel Freshwater Aquarium; Note how clear that water appears in an environment where plants shed leaves and fish shed skin every three days!!! Like everything these days competition has brought way too many options to unsuspecting shoppers. You may have the store attendant ask a question like; what is the flow rate – or for how many fish? That’s the easy question the tough one is do you want corner filters, sponge filters, under gravel filtering, power filter or canister filter? Wow!!! Yes that many options. While maintenance level and bio filtering capability varies, canister filters are often the best rated so you would be better off with one of these – regardless of the aquarium or pond size. They attach easily with sturdy hooks to any aquarium and often have rotating valves that assist you in controlling the flow of water. Bottom line: why spend money on one? Many have a wide base making them even more stable – less likely to tip over if you have a cat or other pet. Before we get to review the 10 best aquarium filters it won’t hurt to glean through how these filters function. Let me begin by ending the myth that canister filters are complicated. Yes they often have more components to attach but in this review you will get to see that they are ideal because they often perform all the water filtration you require; that includes toxin filtration, removal of debris and biological filtration. The best fish tank filter is not necessarily new technology having gone commercial as far back as 1978. The canister filter works by channeling through an airtight filtration system fitted with filtration media. Over the years there have been several design alterations including top to bottom, bottom to top, center out, back to front and outside in filtration. The above thoughts may shed light on why it has taken time to introduce smaller domestic type models with capacity for fewer gallons per hour – smaller aquarium adequate for a single fish. Maybe, I have not really dug up a lot of info on the manufacturing process – so that could be another reason. That being said lets jump right into the reviews and differentiate between the top ten canister aquarium filters. Anyway this is why you will on browsing find most canister filtering systems rated above 4 stars. The canister attached has compartments through which the water flows and comes out clean; hence the inlet and outlet attachments. Basically that’s all an inlet, outlet and power. Additional components are optional and have nothing to do with the water quality which is why you are buying the best canister filter. It is always good to buy products from a company with vast experience and variety of models. History implies experience, improvements and thorough knowledge. 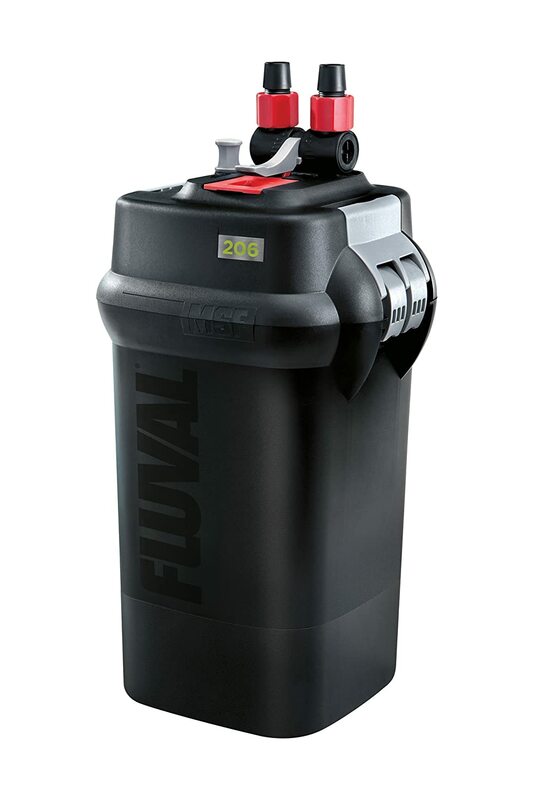 The Fluval 406 is an improved Fluval 405 canister filtration system. Among the improvements include the large foam impeller, stronger lift locking caps and increased motor strength to make water filtration easier; operable in both fresh and salt water fish tanks. The improved Aqua stop valves make an ideal addition as they make hooking the hoses together much easier. The unit is also that much easier to open and close owing to the lift lock clamping mechanism. The canister has multiple filtration baskets each equipped with chemical, biological and mechanical cleaning media that can be replaced in a huff; you don’t even need standby filtration system for routine maintenance. The package you order is complete and contains all you require to keep a sanitary aquarium immediately after assembly. With this unit you can be sure to maintain a clean aquarium and healthy fish even with very little experience with aquatic creatures. Stop waiting and get to choosing you favorite pets. o 4 x 3.5 x 8 inches weighing approx. 10 pounds. o Three filtration media and stages – using the full tank capacity and advanced motor for high speed filtration. o Capable of pumping 155 Gallons per Hour (GPH). o Easy to open unit with sturdy lift lock clamps for speedy maintenance. o Twin foam filtration absorbs debris and prevents clogging of cleaning media. Advanced motor that can maintain strong water flow for long periods. Instead of canister sections the filter uses the entire canister to increase filtration volume. Easy to change filtration media. Poor instruction manual. Assembly could be easier with less cryptic instructions. To say the least this is probably the best fish tank filter for even large indoor tanks; it runs very quietly and is easy to maintain and assemble. 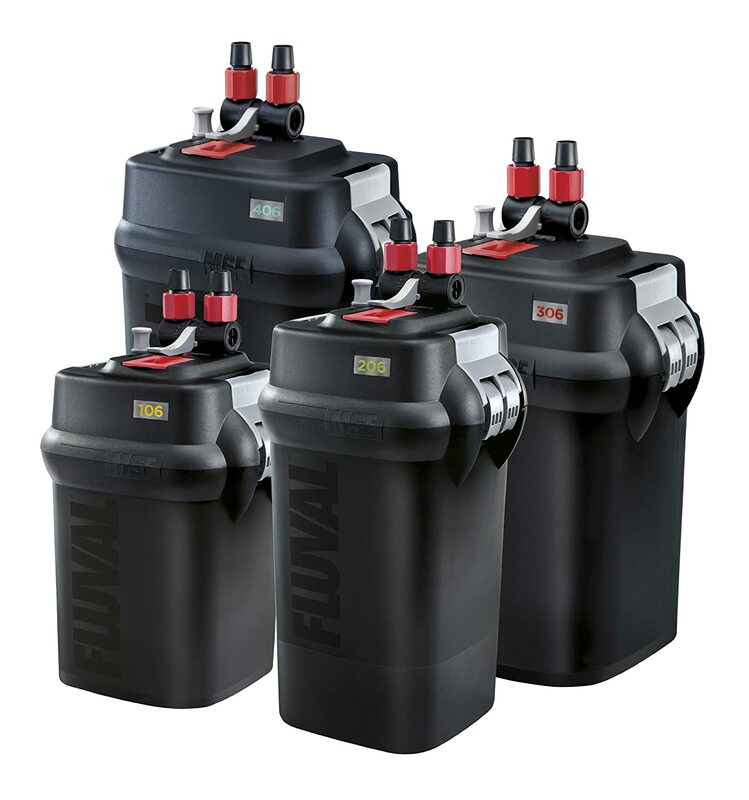 If you are seeking a canister filter that is reliable and strong the Fluval 406 is just what you need. For more please watch this short video on installation. 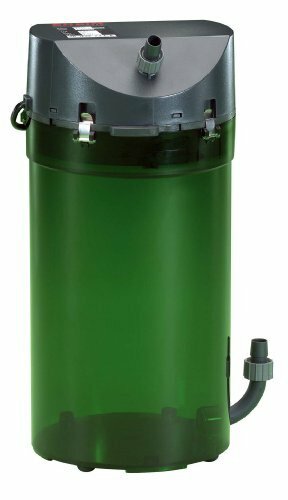 This particular external canister filter is built with very high quality components that will guarantee any aquarium remains as clean as possible. It is probably why the company to date has kept the 30 year old model in production. Old is Gold where the Eheim Classic canister filter is concerned. Because of the high quality design the unit will ensure very high performance at a relatively low cost to the end user. It’s constructed with simple but very effective technology; for instance the unit uses a very simple but effective elastic sealing ring to keep the filtration canister air tight. On purchase your unit should include the canister with a strong built-in pumping mechanism, inlet piping (longer than necessary), hose and useful installation accessories. 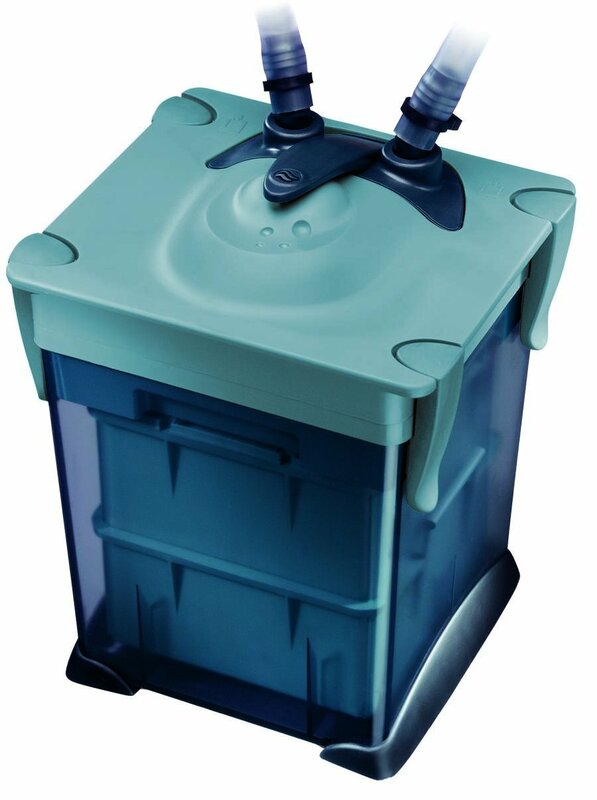 This particular Eheim External Canister Filter is the flagship of the company; it delivers quality and dependability and has for years remained affordable.it’s likely this is the company’s best performing fish tank filter. Operational with fresh and salt water fish tanks. o Maintenance required every 6 months. 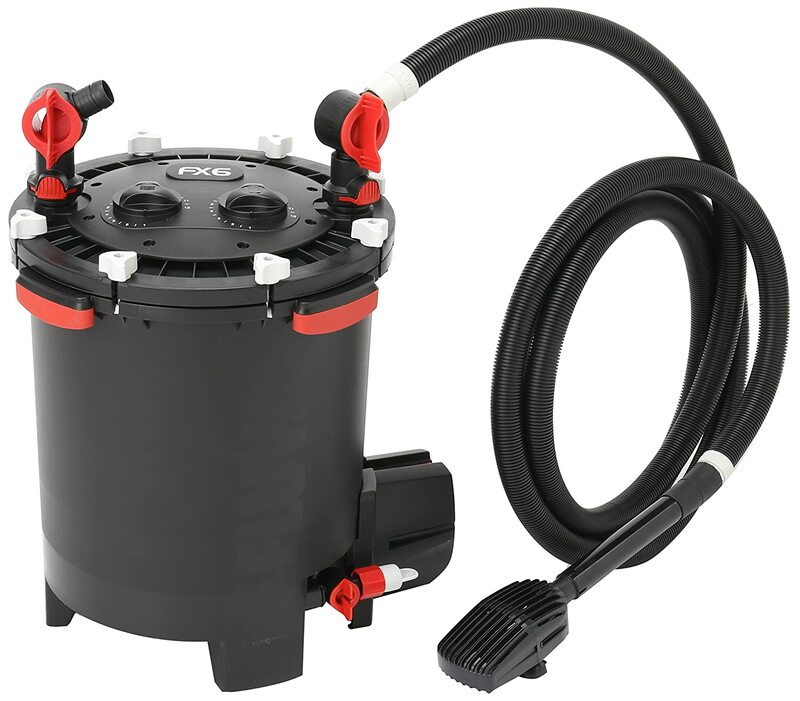 o Operates using quality 1262 high output pump; filtering capacity of 164 GPH. o Can be used on fish tanks of up to 90 Gallons. o Easy to operate coming with two quick-release double tap valves. o Elastic silicone sealing ring for easy maintenance and cleaning. o Horizontal spray bar, inlet piping, hoses and accessories included. 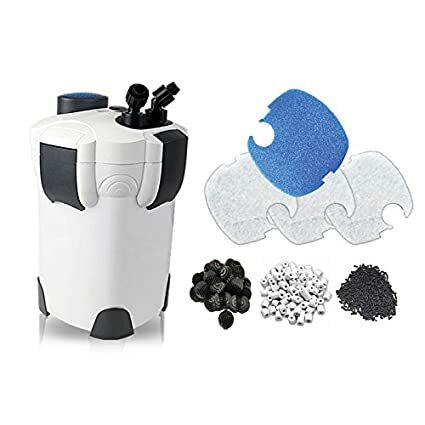 o Additional accessories included two coarse debris filter pads, three fine filter pads, three activated carbon pads and filter wads. Very old and stable model. In production for over 30 years and has been thoroughly tested and reviewed. Has a good amount of filter media included on purchase. Shipped along with 2 media separation plates, pipes and accessories that help you get up and running NOW!!! Instructions are cryptic – skip those and use the diagram to assemble your unit. You may need to cut the piping to attach the inlet and outlet – its extra but not mentioned in the instructions. If you have the time you could wrap the extra and bind with masking tape. Fluval ranges of products are known for high performance. 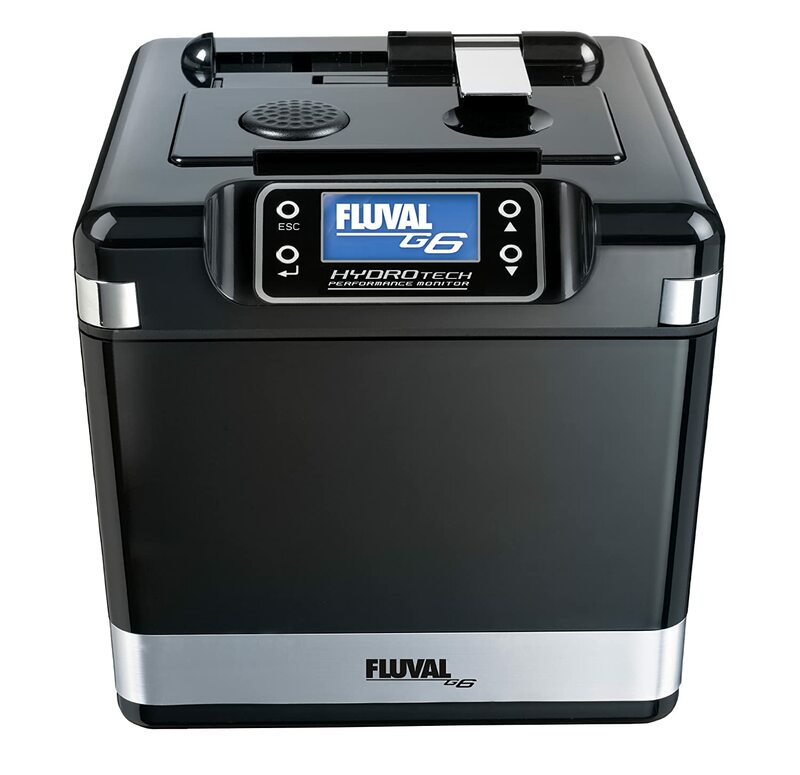 The Fluval 206 has a very reliable filtration system and low noise engine that quickly removes impurities from your aquarium. The high quality construction ensures that users will note that the model requires low maintenance in comparison to competing external canister filters. ​This filter will make keeping your aquarium clean a breeze, and you are more likely to enjoy learning and studying your aquatic pets. Did you know in a healthy environment underwater plants shed leaves and fish shed skin quite often? You need a good filtration system for a truly clean and natural like aquarium indoors. The Fluval filter has improved the hydraulic performance that ensures the filter has a great flow rate. The engine is fitted with patented Bio foam dampening impeller; reducing noise by 15%. The cover is strong but easy to open. Usable in fresh and salt water aquariums. o 4 x 3 x 6 square inch filtration unit. o Great for small aquariums – up to 15 gallons. o Easy to maintain owing to quick-change mechanical filtration media. ​ Very quiet; sound dampening impeller. Durable casing that is easily opened and maintained. Clog-proof strainer attached to the intake. Multiple easy to remove filtration baskets. Superior water flow owing to reliable pump mechanism. You need to be careful about spills give the output nozzle does not have height deflector or spray bar. Owing to the above issue, output nozzle may shake and need anchoring – masking tape will do. If you are just starting out with fish or just want a single fish in a small aquariums / tanks the Fluval 206 External Canister Filter is perfect for your needs. Watch the simple installation video here. Despite the small size you will immediately notice the quality of the construction and accessories on purchase. It is a bargain for small aquarium owners!!! This is one of those powerful and low maintenance filters with an anti airlock system that keeps it operating silently and consistently. It is super quiet; right from the time you [plug-in the unit you may have to look around the living room for the whirring sound. Kidding!!! ​Plus, with the three year warranty it looks like you do not have to fret about maintenance for a while. The quiet engine is powerful and you can filter substantial volumes quite fast. The unit is fitted with multi stage baskets that cater for chemical, biological and debris filtration. The unit is also designed with advanced priming technology that starts it up real quick each time. Owing to design it is rated among the best external canister filters on the market today! Solid construction ensures you have a reliable and tough water filtration system. Operational with fresh and salt water aquariums / tanks. o Measures 9 x 13.5 x 15 inches; weighs 2 pounds unpacked. o Patented Bio-Chem Zorb system removes more toxins using an exclusive resin blend. o Advanced self priming technology; no manual pumping or siphoning. o Anti airlock system ensures you can remove the canister without losing prime. o Patented API bio-chem zorb removes chemical toxins better than carbon. o The patented absorbent mechanism / material remove 4x more bacteria. o 3 stage filtration system. o Self priming with easy ignition. o Automatic water shut off system that prevents any flow during maintenance. o The assembly requires some skill. The directions are clear but need to be followed closely; take your time. If you are seeking affordable, effective filtration with strong flow rate and minimal maintenance, this is the filter you need. If you do not like too much tech and own average sized aquarium / tank then this might be what you need. If you are in search of something with heavy duty performance and an affordable price then look no more. This external canister aquarium filter can be used in small to average sized fish tanks with maximum capacity of 100 gallons. ​The Penn Plax is fitted with powerful pump with capacity as high as 250 GPH; this combined with advanced filtration mechanism means CRYSTAL clear water. The filtration process uses a floss pad and activated carbon to remove impurities in the water. It also has an absorbent sponge used in biological filtration; sponge is natural filter with huge advantages where increasing surface area is a concern. In nature sponge promotes growth and propagation of useful bacteria and removes harmful bacteria and organisms. Sponges also remove waste food and debris, nitrates and ammonia that in specific concentrations will harm fish and aquatic pets. The entire unit is built solid and ideal for those seeking low maintenance filtration systems. The unit can be used in fresh and salt water aquariums. o Measures 17 x 10 x 11.5 inches. When unpacked weighs 12 pounds. o 360 degree rotating valve caps; you can direct the flow perfectly. o Built with a wide base and remains stable; perfect if you have a cat or other pet. o You can use flow rate adjustment to control valves. o Easy button operated primer; starts with push of a button. o Heavy duty filtration mechanism. o Simple set up will have you good to go in minutes. o Main canister is sealed and can make cleaning difficult. o You need to buy pouches to replace the carbon; you have to go to the store to have this done. This is the ideal heavy duty canister filtering system for those seeking performance and affordability. Advanced biological filtration promotes growth of useful bacteria while removing impurities and harmful organisms. Low maintenance. The Fluval G6 External filter system is very modern and incorporates the best in technology. If you are willing to pay top dollar and enjoy the latest and best in filtration technology then this is the perfect product for you. ​Personally, the hydro-monitoring mechanism seems perfect for office or building aquariums that may be require attention while you are away. ​The advanced Hydro Tech monitoring system checks and reports on filter performance; water quality and parameters and cleaning intervals. The advanced monitoring system has a highly sensitive sensor that keeps you aware of exactly what is going on in the water 24/7. Just based on the reviews alone you can bet this is the filtration system of the future! The Fluval G6 works just as well with fresh and salt water fish tanks. ​ Easy to start with priming button. Instant Aqua stop maintenance system for easy cleaning. Three stage drive filtration system and pump. ​Though the unit is relatively expensive; maintenance costs are low; Cheap is expensive. You pay more upfront and Zero in the long run. If you have an expensive fish pond or tank; or are seeking an expensive gift for a co worker then this is the product for you. Though it seems pricey the features and technology plus low maintenance makes this the best buy. This filtration system is the Maybach of filtration technology; the ultimate luxury car. Click here for installation video. Like the bigger and better G6 this is another of the futuristic external canister aquarium filters. It has all the same advanced functionality and components of the Fluval G6 described above but is made to drive smaller fish tanks. Just like the G6 it looks a lot more like a printer than an aquarium filtration device. Hence, it would really fit in well in building and office aquariums and fish tanks. Plus using the advanced water monitoring technology it is ideal for a fish tank that may require attention while you are away. The water monitor has cool backlit LCD panel that shows how much water is getting filtered, your maintenance schedule and the filters operating performance; it is quiet too. The stylish and modern design adds a very high tech look to any aquarium!! Works well with fresh and salt water fish tanks. o 10 x 9 x 10 inches; weighs approx 18.8 pounds unpacked. o Button operated self priming function. o Backlit LCD panel display details on water temperature, conductivity and flow rate. o Heavy duty pump with 340 GPH output capacity; Filtration capacity of 185 GPH. o Can serve small tanks up to 80Gallons. o Lever operated canister clamps. o Looks very stylish and modern. o Easy button operated primer. o Three stage filtration mechanism. o Advanced electronic monitoring system. o Owing to compact design, filtration media is small and require cleaning often. Like its bigger brother the G6 this is ideal for that very top of the range filter system buyer. The advanced water monitoring technology provides info on exactly what is happening in the fish tank. For more watch at the installation video here! It is compact being designed for smaller tanks but comes with very powerful and quiet pump; it can clean large volumes of water very fast. Like all things Japanese you can expect a lot from this automated aquarium filter. These canister filters are rectangular in shape unlike the majority that is designed with cylindrical canisters. ​The rectangular design appears to favor this canister filter given the tight fit of the filtration baskets, superior sound proofing all of which makes this model very efficient. Hydor started producing aquarium filters in 1984 and have hast experience in the production of hanging filters. 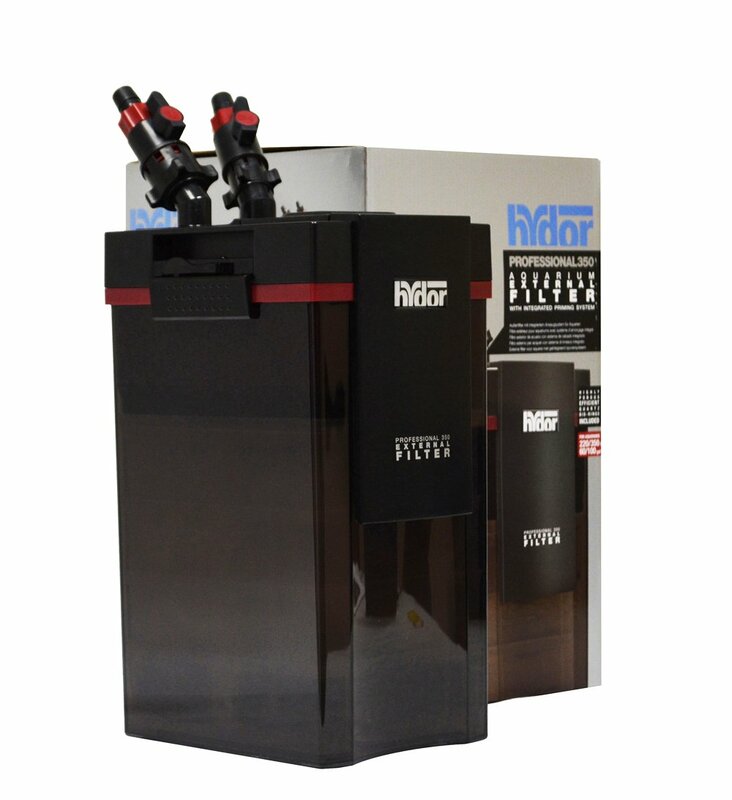 The Hydor canister filter performs three stage filtration including biological, chemical and mechanical. Chemical filtration is done using activated carbon that eliminates any odor and dissolved pollutants in the water. This Hydor model utilizes porous sponge for biological filtration. Just like in nature sponge acts as a filter with larger surface area for filtration; it promotes growth of useful bacteria while eliminating harmful organisms present in the water. Effective in fresh & salt water filtration systems. Overall it delivers high quality performance and yet remains affordable. o 3 stage media trays. o Filtration materials including sintered quartz filter floss and black foam pad. o Intake and Outtake valves and hoses. o Input and output piping. o Stylish and stable rectangular design with 4 rubber feet; keeps the filter safe from pets. o Very sturdy and easy to use locking clamps for quick and secure sealing and maintenance. o Ceramic motor shaft that adds life to the engine. o Curved front facing design to ensure you never set up with the wrong side up. o Adjustable overhead spray bar suits various fish tank sizes. o Button operated priming for quick start. o The plastic material used in construction is always disappointing. Though the filtration system is relatively new; just getting 4.3 stars average on rating on many online shopping sites gives the pump a thumbs up!!! It is very quiet and can work with heavy bio loads such as Turtles in a pond. That and the affordable pricing should make this a great bargain for anyone looking to save money and get consistent results. For more on installation of this filter watch this short video. It is always advisable to purchase products from manufacturers with a long history with the industry / product. Like many of the above mentioned Fluval filters this too delivers the best quality and is built to last. ​This is another of the filters from the same manufacturer that has some futuristic element to the design. For instance, the filter has a Hydro monitor that keeps track of happenings within the water 24 hours. You can read the water temperature, conductivity and pump operating stats at a glance. The filter is built for heavy duty performance and is suitable for large aquariums with many fish. As such it has very powerful pump and relatively high GPH; both contribute to excellent filtration and crystal clear water. Performs well in Fresh and Salt water fish tanks. o Hoses, valves and filtration components. o Foam filter pads, Bio foam pad and Bio rings. o Production improvements have this filter rated 15% more energy efficient the Fluval FX5. o Locking caps make cleaning and replacement of filtration media simple. o Hydro technology monitoring system. Powerful pump and high GPH filtration capacity. For anyone seeking a powerful and stylish easy to operate filtration system this could be what you are seeking. 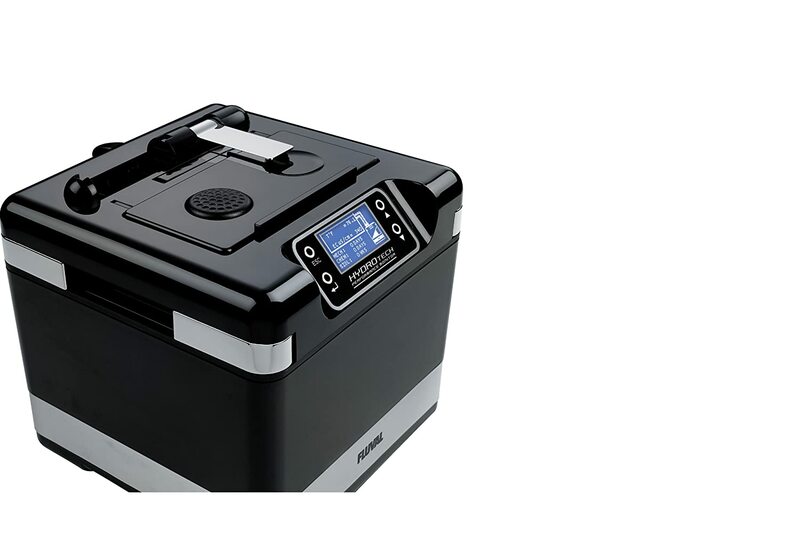 The improved power consumption and easy maintenance makes it a must have given it can be setup and operated by even a novice. This video could be useful for tips on setup and maintenance. Like many products built in Asia this filter is built with performance and price considerations. For that reason whatever it may lack in extra components and stylish design is made up for in consistent results and lower prices for the consumer. ​With that in mind you should consider this external canister filter for tucked away fish tanks where the aesthetic appeal does not really matter; or if you are shopping on a budget or just need a reliable back up to use during maintenance downtimes. o Measures 9 x 9 x 15 inches; gross shipping weight approx 9.4 pounds. o Three stage filtration canister and media. o Intake and output hoses and valves. o Adjustable overhead spray bar. o Shipping is fast for an overseas product. o Effective filtration for small sized tanks. o Poor finishing – plastic look. Given the performance this filtration system is ideal for starters / newbie’s who are not quite confident enough to make a big investment in their aquatic pets. Most filtrations systems in this category cost 2X the price of this unit. However, you will be glad to hear that even breeders have given this filtration system thumbs up; says something about consistency. For the price and performance the relatively plastic finish should not really mean much. Through the review we have shared quite a bit in relation purchasing the most suitable external canister filter system. Aquatic pets are expensive and keeping them healthy is a challenge in itself; therefore take time and prepare a budget before investing in the fish, tank or filtration mechanism. o Regardless of size to keep fish healthy the filtration system must be able to pass all the water through at least 4X an hour. o Bio load varies with aquatic pets therefore if you want to combine say turtles and fish; filtration requirements will vary. Bottom line - do not just add a new pet without asking some questions. o Do not buy cheap, Buy efficiency. o Plants, fish and other the entire aquatic ecosystem excrete, shed leaves or whither and need to have their environment sanitary even in nature. 1: What is the tubing size? 2: Will it make the water clear? 3: Can this filter be used salt water aquarium? 4: Is it noisy when it works? It is exceptionally quiet. When you let the air fly out of the system and if the water level of the tank is higher than the water return, you will not hear any sound. 5:Can the filter run with a half full tank? Or it needs a full tank so it can work? 6: Does it need activated charcoal? 7:The filter will be on and off after a short time? 8: How long I should change the tank water? 9: My canister is 10 months and it is very noisy, what should I do? 10: Can I put the canister below the aquarium? 11: Does it have a flow adjustment? Such a great review, I am sure you did great level of research work on the all 10 Canister Filter for fish tank, I prefer to have a Canister Filter for my fish tank that could live longer period of time and my like Fluval G6 much more than others.